If you go down to the woods today, you’ll find another great review! They weren’t too hot or too cold, they were just right! Thanks for the great review, it was great working with you and we got some good recipe ideas from you as well. Don’t be tricked by the big bad print wolf, talk to us instead on 01332 418377 and we’ll make sure that everything is just right for you as well. 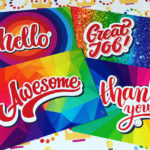 PreviousPrevious post:A hat trick for the Print Angels – “Excellent service, excellent printing, excellent delivery”NextNext post:“Excellent Service” – Great feedback to start the week off!